Hard to think of a nicer time of year…the warm temperatures, the sunshine, the plants growing from what appeared to be dead, barren earth. I love to plant things. Getting my hands in the dirt, planting new flowers and vegetables is therapeutic for me. It must be similar to an artist with a blank canvas. 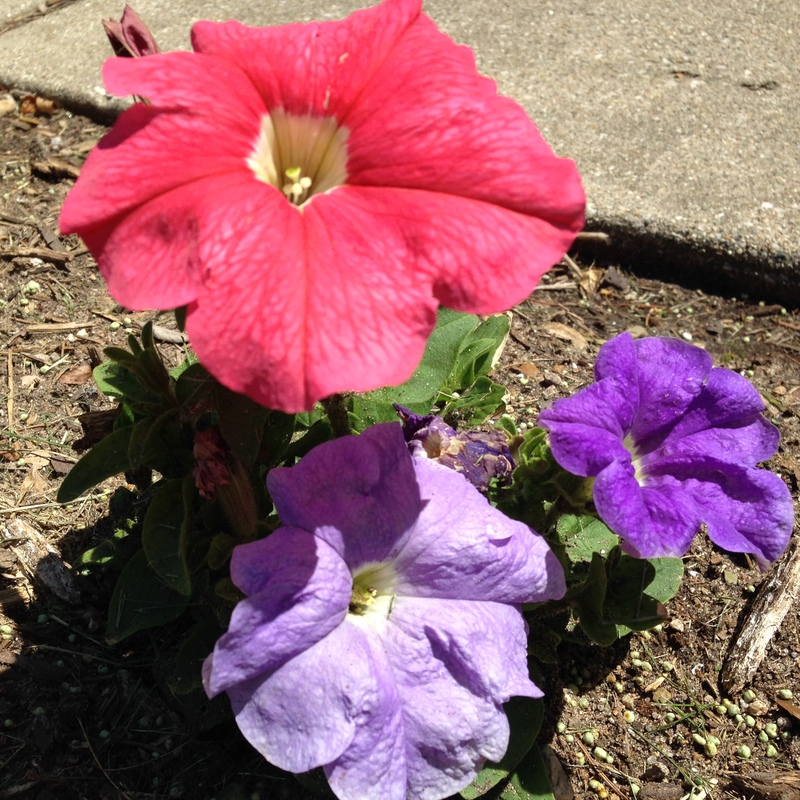 I love it…but in Michigan, you have to be careful what you plant and when you plant it. Plant things too early, and you just may get a frost or freeze–like winter’s last ‘right hook’ that can take those plants out. If, however, you do it right, there are few things more beautiful. In life, we have to be careful what we ‘plant’ also. And very often, we do so by our words. I want to use my words to build up. I try to use my words to build my wife up and let her know how much she means to me. I try to make sure my kids know how much I love them, the potential and gifting I see in each one of them, and how proud I am of them. At church, I try to use my words to ‘plant’ faith in people. Be careful what you plant. Something happens in your life–a setback, a reminder of a setback, or even a thought about a potential problem, and suddenly you find yourself on a ‘downward spiral’ of negative thoughts and self-loathing? In very little time you can go from a ‘normal’ day to a battle within your mind, where you find yourself discouraged, or even hopeless. I have had that experience a few times, most recently this morning. When this happens…this overwhelming, cataclysmic onslaught of negative thoughts, I think it’s more than simply ‘a bad day’. I believe, in those times, it is a spiritual attack from our enemy, satan (yes, I believe he’s real, and he’s active in this world–like Jesus taught). The enemy of our souls is always seeking to “steal, kill and destroy” God’s work in this world, and he frequently does so by targeting us. Very often the ‘target’ of his attack is our mind…our thoughts. If we’re not careful, and if we’re not paying attention to what’s going on, we can find ourselves ‘on the ropes’ being pummeled (spiritually speaking). In those cases, we may question God’s love for us, His ability to use us and work in/through us. We may question our future, our relationships, our profession and calling…all of which is playing into his hands. What we need to do instead is to prayerfully take back control of our thoughts, submit them to God, and believe instead what God says about us. In fact, those are good passages to read and re-read, meditating on and soaking in…Psalm 121; Romans 8; Ephesians 6. The point is this: Rather than believing the lies of the enemy, or the junk of this world, we have a choice to make: We must believe the truth of God’s Word! We must stand on what HE says about us–nothing else, and no one else. THAT is our secret to victory. Don’t let faithless, hopeless and dark thoughts control you…take them captive and stand on the Word of God instead! A lifelong friend–one you love, one you’ve shared great memories with, one you have ‘done life’ with–starts into a ‘downward spiral’ of bad decisions, self-destructive behavior and foolishness? You know that, if something doesn’t happen, that friend will ‘crash and burn’, and it will be ugly. They’ll probably take you and others with them, and it will be devastating for all involved. You warn them, you try to enlighten them, you try to stop them. Ultimately, you know that, IF they don’t see the problem and seek help for themselves, then your efforts–however well-intentioned, will fail. I am in that situation right now. I have a friend who is ‘going off the rails’. My friend has known me my whole life. I have loved my friend, and vice-versa. We have grown together, celebrated each other, and enabled one another to become more than we ever could on our own. We have great memories with one another, and I (at least) have sincere hope and prayer that my friend will turn away from their own destruction, and will turn back to a healthy, happy, blessed way of life that will welcome God back in. My heart hurts for my friend. But now, my friend has started to turn their back on me, and has started to react negatively, even angrily, to my concerns. Whenever I try to say something, they accuse me of being hateful, small-minded, even mean. My friend wants me to come along with them on their downward spiral, and to pretend it’s really a good thing. I know my friend is on a path to destruction, and as much as it tears me apart, I can’t go along with them. I hurt for what I know is in their future…I ache for the pain I will see in their lives if they stay on this track. Ultimately, it’s their decision, but I cannot go with them. I will not. Instead, I will pray for them, love them, try to point them back to a healthy, sustainable, God-honoring way of living, and I will always have my door (and my heart) open, whenever they want to turn back. I’m not sure they will, though, and that will be hard. They’ve found a new group of friends–many, in fact, who love the path my friend is on. They join with my friend, encourage them on this path, even cheer my friend onward. I foresee a day–maybe in the near future–when my friend attacks me–that’s right, the friend I’ve loved, grown up with and celebrated will (as much as I hate to say it) turn on me. I know it will happen. It’s happening now. All I can do is stay true to my friend–what they really need, not what their new friends are telling them–and continue to stay faithful to the One who made us both happy, healthy, and blessed. Maybe my friend will turn around. Names…they can mean a lot. My parents–who had to come up with a LOT of names (I’m one of 13 kids)–always tried to name us after Biblical characters. They took the names seriously. My name–David Matthew Joseph Johnson (‘Joseph’ was my Confirmation name) means “Beloved, Gift of God, Increasing Faith, God is Gracious”. It does seems that, lately, parents think more about what their kids’ names sound like, more than what they mean. But names here on earth are not nearly as important as the name that God gives us. He calls us all ‘My Child‘, and knows us each by name. We are given that ‘name’ based on our Relationship with Him, through our faith in Jesus, the Son. Because of that relationship, we are adopted into the family of God. That ‘adoption’–God adopting us into His family by virtue of our faith in Jesus Christ–changes everything! It is this loving, grace-filled and life-giving relationship which motivates us to change. We no longer try to ‘avoid sin’ out of fear or legalism, but rather, we find ourselves increasingly changed within so that we don’t want to sin–because of our love for God! We want to love and obey Him! It’s like the child who grows up in a loving, affirming, Biblically-balanced home–they are not those who ‘can’t wait to get out’ and live sinfully. Rather, they know that, even when the parent isn’t around, they want to honor that relationship, so they don’t do the things that would sabotage or hurt it, because that relationship is still important to them, and they know that the relationship has been based on love and is for their good! That’s what God works in us when we become ‘Children of God’. His Spirit begins working from within–changing our hearts, motives, desires–making us more like Jesus, NOT because we ‘have to be’, but because we ‘want to be’ like Him. It is our new nature! Romans 8:11-14: “The Spirit of God, who raised Jesus from the dead, lives in you. And just as God raised Christ Jesus from the dead, he will give life to your mortal bodies by this same Spirit living within you. This is great news! We don’t ‘have to’ sin! We can walk with the Spirit, enjoying our relationship with the Father, through our faith in the Son, and…as a result…we realize that we don’t want to sin! Why would we jeopardize that relationship? It all hinges on that new relationship…the adoption into His family. Your name, your destiny, your direction, your eternity…ALL have been changed, due to His adopting you into His family–the Family of God, through Jesus Christ. Child of God is what you are now…that is what He calls you. Enjoy Him. Love Him. Worship Him. Draw close to Him. You’ll find that sin–whatever it is–suddenly has very little power over you. Start thinking that way, and He will change you! America. Land of the free, home of the brave. Great Land of liberty, of Thee I sing. In the past, it has been possible–even encouraged–to be a Christian–a biblical, evangelical, committed Christian–in America. In the relatively recent past, even those Americans who were not ‘overtly religious’ were open to and welcomed the influence of Christianity on our culture. The foundations in Christianity resulted in the priorities of Freedom and Liberty, but also certain ‘foundational values’, such as a commitment to Family, Personal Integrity and Responsibility, Respect for others. Even the free market system was based on values of ‘hard work, risk, responsibility, and reward’–all within a framework of honesty. Generosity was encouraged, as was Compassion. Many of these values arose out of a ‘friendliness’ to Christianity, at the very least. Christians within America knew and embraced the Truth found in Scripture that ‘Blessed is the nation whose God is the Lord” (Psalm 33:12). American Christians embraced this, and all Americans benefited from it. In it’s first 200 years, America went from a non-entity to the most powerful, most prosperous, most generous nation on the face of the earth, and it stood with those who sought freedom and opposed tyranny. Each citizen had a ‘say’ in how the country was run–through the electoral process. The freedom to vote, which had been restricted to the privileged few, was now open to all. Certainly, it was not perfect…but America was unique in history in its commitment to freedom, liberty, equality, morality, and its dependence on the influence of Judeo-Christianity. The Church–those believers in Jesus Christ that live their faith on a day-to-day basis–was influential in the culture, and the economy, the halls of power. Over the last few decades, however, it’s changed…a lot! Our culture has moved increasingly (and with increasing speed) away from the influence of Christianity, and have replaced with relativistic, humanistic thought in which ‘everyone does what is right in his own eyes’ (see Judges 17:6; 21:25). The Church responded, not by repenting of its own sin and worldliness, but by linking itself to politics and politicians for their ‘salvation’. We tried to find ‘the right person’ and pass ‘the right laws’ to champion our causes. Instead of seeking God, we sought political power. It has ‘worked’, to a small extent, at times…but not any more. Now, we have a choice to elect an egotistical, misogynistic, arrogant businessman, who bullies and shames opponents, rather than resort to mature discussion, debate and compromise. Our other choice is an arrogant, pandering control freak who wants the government to interfere and control everything (and everyone) from cradle to grave, and seems to want to target biblical Christianity in doing so. Neither, in my opinion, has the class, humility, maturity and ‘gravitas’ to be President…but, barring some amazing turn of circumstances, one will be. Now, the Church is left pretty much on the outside, looking in. Neither candidate is all that interested in the ‘Christian’ perspective, and neither is going to be ‘defending’ Biblical values, much less ‘promoting’ them. In other words, we’re to do what we should have been doing all along…looking to the Lord for our direction, and building on His Word as our foundation. Who knows? Maybe in God’s plan, the Church in America, now focused on BEING the Church in America, will result in America coming back to the Lord…but even if it doesn’t, our focus is clear. BE the Church by BEING committed, worshipful, loving Christ-followers. *Note: This does not mean totally ‘unplugging’ from politics…but that’s another Blog. You have a bunch of money that you’ve saved up (undoubtedly from using Dave Ramsey’s methods) for a new car. You are now in the position that you can go to the lot, pick out the car you want in the color you want with the options you want, and pay cash for it! So you do it, sign the papers and the salesman hands you the keys. You’re excited! You can’t wait to drive this ‘dream car’ around, show your family and friends, and tell them all about it. So you sit down, adjust the mirrors, buckle up and turn the key. You can’t believe it. You pop the hood and look…and realize there’s no BATTERY in the car! Just an oversight…the service team forgot to put a new one in there, and soon you’re on your way. Trying to drive a car–no matter how new, how sleek, how many options, etc.–without a battery–the Power Source–is obviously ridiculous. Yet, many Christians try to live the ‘Christian Life’ without a Power Source. The Holy Spirit is that Power Source, and He is ABSOLUTELY CRUCIAL to your faith. Later on, we see Peter–the very one who denied Jesus 3 times on the night of His betrayal–boldly standing in front of crowds of people (Acts 2) and religious leaders (Acts 5) standing on the name of Jesus, and confidently asserting that He is the Messiah, and has risen from the dead! What happened to him? What changed him? He was now ABSOLUTELY CONVINCED that Jesus is alive! He’d seen Him, talked to Him, eaten with Him, touched Him, and been restored by Him. He also now had the Holy Spirit come upon Him–and was now within Him! From that day forward, the Church–the body of Christ–moved out and changed the world, boldly proclaiming that Jesus IS Savior and Lord! The Power Source–the Holy Spirit–enabled them to be bold, be confident, to work miracles in Jesus name–and to face their own death with confidence in His ability to help them conquer it. That 1-2 punch–Absolute Belief in Jesus, and the Power of the Holy Spirit within–is why they were so effective. Here’s the thing: I believe many Christians today have some degree of both of these things, but are not fully ‘transformed’ by either. We believe that Jesus rose from the dead…but not to the extent that it’s really ‘changed’ us (as it did them, who walked and talked with Him), and we have been influenced by the Holy Spirit (after all, we’ve come to faith because of His leading), but are not ‘led by’ Him. The Scriptures–especially the rest of the New Testament–give encouragement to ‘walk with’ the Holy Spirit, to be ‘led by’ the Holy Spirit, to ‘submit to’ the Holy Spirit, to ‘be empowered by’ the Holy Spirit…yet, the Holy Spirit makes us uncomfortable, and we don’t quite understand Him, so we shy away. That’s sort of like trying to drive a new car with no battery. No dice. HOW, then, are we ‘led by’ Him? It’s an awareness and an influence that we can cultivate, and He wants to cultivate…but first, we must welcome Him. We must willingly submit to Him. It’s an ongoing commitment to ‘always keep being filled’ (Ephesians 5:18) His presence and influence. Question: Has your faith been an ’empowering’ and ‘transformative’ faith? Have you felt the POWER that comes from the Holy Spirit in your life? Have you had more boldness, more love, and more passion to speak the name of Jesus to family, friends and perfect strangers? Have you sensed His leading, and learned to listen and follow? Maybe you’re driving without a battery. Ask God to help you be CONVINCED of Jesus’ resurrection and the ‘relationship’ you can have with Him now, and ask Him to help you sense the leading of the Holy Spirit more, and the courage to step out and follow. Cultivate that relationship…and you will receive POWER!